If you find your simulation does not work as your expected, especially some elements do not respond your input, you will need to troubleshoot your simulation and fix the expression in your plot. The primary problem is to find out which element has incorrectly defined actions. The troubleshooting is not difficult at all, you don’t have to be a programmer to understand the process. The Firefox + Firebug combination is my favorite, and I will use it as example. If you use other debuggers, the GUI of debugger may vary but the main idea is still the same. As you can see, I inserted an additional double quotation marks at the end of the message to show. Since the double quotation marks is not escaped and it can not find the pairing in the message, it will be kept in the message and break the syntax of the script and halt the simulation. When we run the simulation in Firefox (with Firebug installed and activated), Firebug immediately detect the syntax error and show it in Firebug console. Here we don’t need to understand what’s wrong with the code, just find out where the problem is. 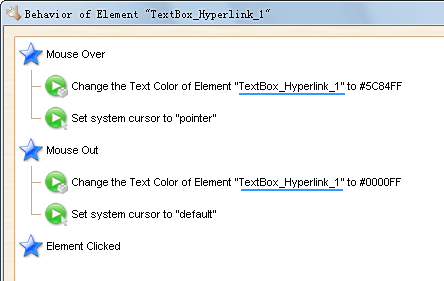 As highlighted above, the error is in a function started with “Button_2″, which means the error happens in Button_2. Clicking on the search result will bring us to the page and select the target element. We can press Ctrl+D to review its action definition. 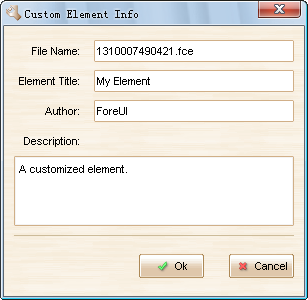 Supporting custom element is one of the killer features of ForeUI. This article will introduce the basic knowledge and advanced tricks of custom element creation. You will be asked to input some information of the custom element. File name may not be so important if you are just saving a custom element for your own usage. You will be able to find the saved custom element file (.fce) in the “<UserDir>/.foreui/customize” directory, where the <UserDir> is your user directory in your system. It will be good practise to input a meaningful element title and description. After clicking the “Ok” button, your custom element will be listed in the “Custom Elements” category (you can find it in the “All Elements” category as well). Then you can use it like standard elements. 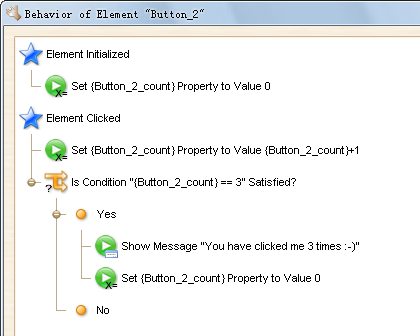 When you select some elements to create custom element, if the selected elements have behavior defined, the behavior will be packed into custom element as well. 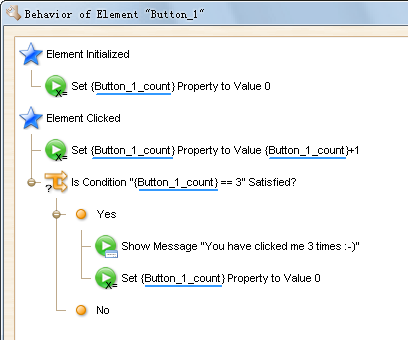 That means the custom element can have its own function. 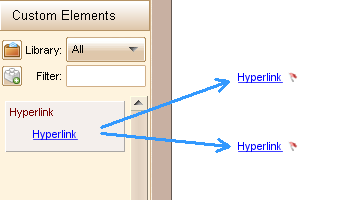 As shown in figure above, it handles the “Mouse Over” and “Mouse Out” events to change its text color and the cursor shape (to simulate a hyperlink). 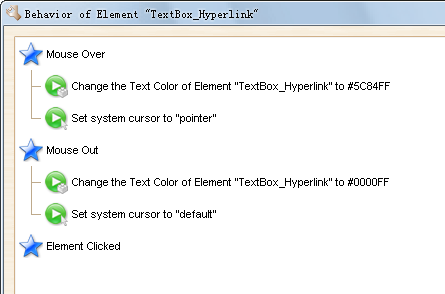 “Element Clicked” event handler is created but it is still empty, you can add some actions that need to be executed when hyperlink is clicked. As you can see, the behavior definition of each instance is separated, and they will not interfere each other. You may already know that, the user defined property and custom event are all in global scope. If you like to define them in your custom element, you will have to consider what will happen if multiple instances are created. 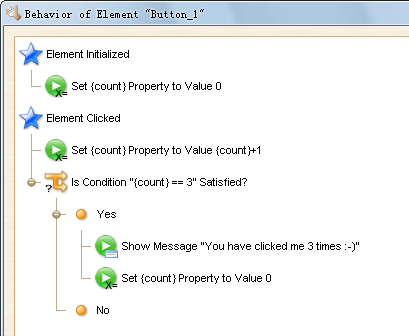 It maintains a user defined property named “count”, so a message box will be shown when you click the button 3 times. If you pack this button as custom element, you will find it works well when it has only one instance in your plot, while it doesn’t work correctly if multiple instances are created, since all instances are using the same global property “count”. ForeUI does not support user defined property with element scope. Fortunately we have workaround for this case: use the element id as the prefix of global property, thus it become unique for the current element. Let’s pack the button as a custom element, and see what happen if multiple instances are added. As you can see, the user defined property name has been updated, thus it is still unique for the new instance. By using this trick, the custom element can also work well with multiple instances. This trick is also applicable for custom event. If you have a custom event defined in a custom element, and wish it become unique for every instance of the element, you can use the element id as the prefix of the custom event name.